Undocumented and unemployed, Jesús Torres (1898–1949) came to the United States from Mexico in search of factory work. He became one of Chicago’s most in-demand artists. Known for his work in multiple mediums, Jesús Torres took Chicago’s art world by storm in the 1930s and ’40s. Though he never received formal artistic training, his prodigious talent had deep roots that stretched back to his boyhood. Torres was born on June 29, 1898 in Silao, Guanajuato, in central Mexico. Then a small town, Silao was known as a vibrant artisan community. Jesús grew up surrounded by silversmiths, potters, and carpenters, and his father owned a leather goods business. Torres remained in Mexico’s Bajío region until early adulthood, marrying María Francisca Araujo and working as a fieldworker. In 1924, the young couple set out for the United States, where seasonal employment opportunities had opened up to Mexican laborers in the wake of restrictive immigration laws targeting European and East Asian workers. The Torreses rode the Golden State Limited passenger train north, initially settling near relatives in Texas. They spent the next few years wandering the Midwest for work, María as a domestic laborer, Jesús as a road construction worker. After briefly settling in St. Paul, Minnesota, where Jesús worked in the sugar beet industry, the couple heard that Chicago was replete with industrial jobs, and they uprooted again. But Torres, with his slight build and small hands, wasn’t well suited for the kind of manual labor demanded by Chicago’s factories and stockyards. Restless, he kept his hands busy. As he recounted to the Chicago Tribune in 1942, it was during this time that he started experimenting with sculpture. He shaped old tin cans into decorative objects, first trying his hand at a lampshade, then expanding to other items. Still out of a paying job, Torres enrolled in English classes at Hull-House, the famed settlement house on the city’s Near West Side, in the late 1920s. Co-founded by social reformers Jane Addams and Ellen Gates Starr, Hull-House was an educational nexus, offering programs and support to low-income and immigrant Chicagoans from all ethnicities and creeds. 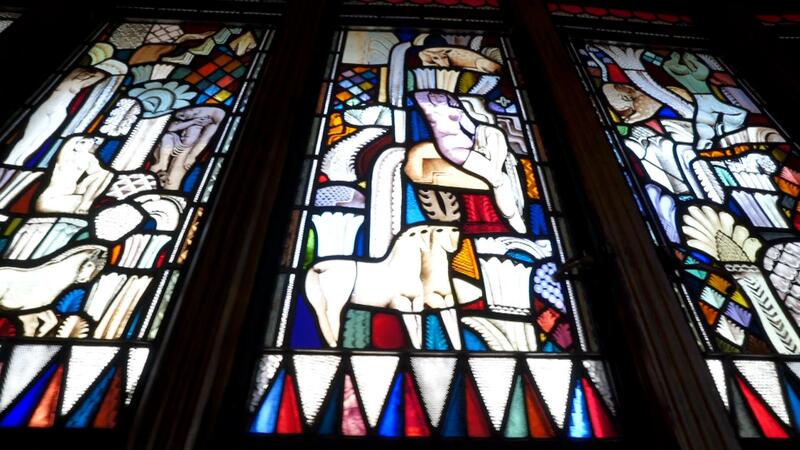 It was also a cultural nexus, offering art classes taught by some of Chicago’s most laureled artists. 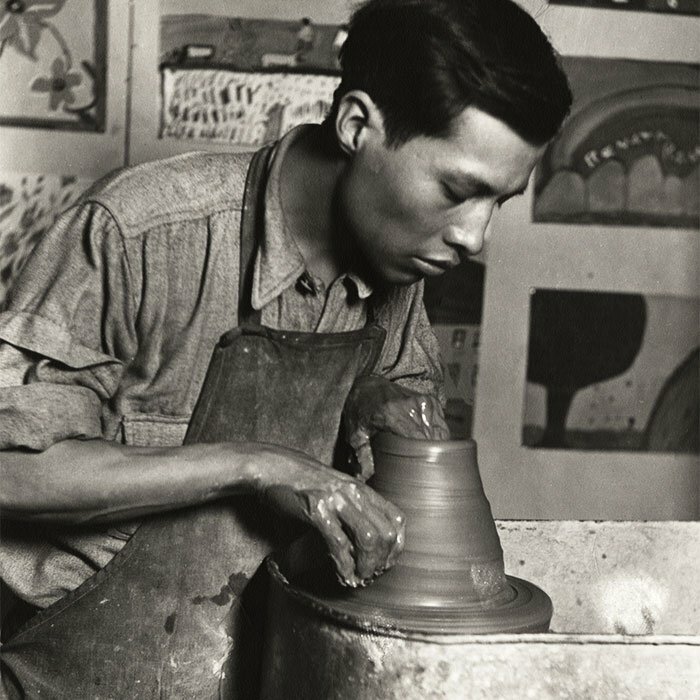 Torres paired his language course with a pottery class taught by the modernist Morris Topchevsky. Topchevsky and Torres shared quite a bit of common ground: Topchevsky, too, had enrolled in Hull-House art courses after emigrating from Poland as a young man, and he had just returned from a years-long stint in Mexico, where he’d befriended such artists as Diego Rivera and José Clemente Orozco. During his very first class, Torres astonished Topchevsky by sculpting a perfectly shaped human head on his first try. According to a 1947 Tribune profile of Torres, a Hull-House faculty member offered to buy it before it was even placed in the kiln. Some of Torres’s peers at the Hull-House Kilns also went on to become exhibited professionals, including sculptors Miguel Juárez, José Ruíz, and Hilarion Tinoco. These artists’ rise coincided with the Mexican nationalist art movement, when artists such as Topchevsky flocked to Mexico to learn from prominent muralists such as Diego Rivera. The movement also affected commercial art trends, with white Americans clamoring to collect Mexican-inspired art and decor. Forged in an entirely different context, Torres’s designs were distinct from this movement: rather than pointedly engage with contemporary socio-political themes, his work was informed by indigenous art and particularly Aztec symbology, embracing a precolonial expression of Mexican nationalism. Expanding his mediums to include leather and wood, Torres enjoyed special repute in both gallery spaces and consumer craft circles. He exhibited his work at such renowned venues asthe University of Chicago’s Renaissance Society and made jewelry on the side for socialites. Even as a successful artist, Torres never shook the thriftiness of his laboring years, sometimes using repurposed dental equipment as tools. Torres soon discovered an area in which he could effectively combine his myriad talents: interior design. After enrolling at the Hull-House Kilns, he was selected the lead assistant to influential designer and architect Edgar Miller. Along with other Hull-House–trained artists, he helped build and design Miller’s famous Carl Street Studios in Old Town – his handiwork is still visible on the studios’ ornately carved doors and colorful ceramic tiles. Fêted as a solo designer, he received commissions within and outside Chicago, gaining acclaim throughout the Midwest for his handiwork in everything from mosaic tilework to woodcarving. 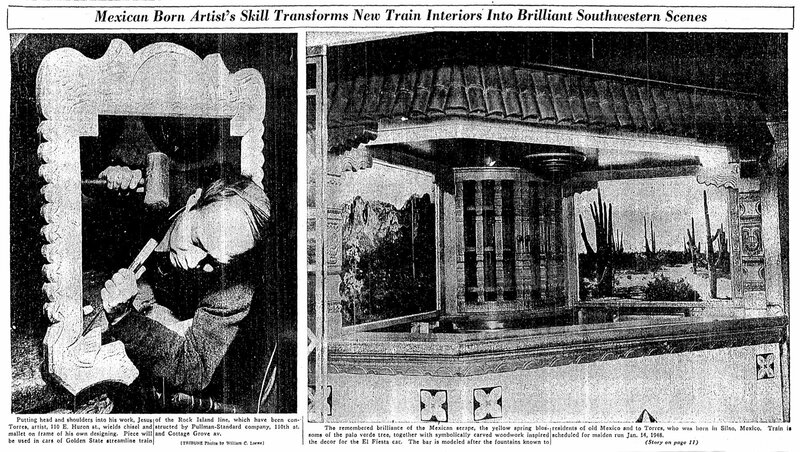 Torres designed extravagant interiors for Pullman railcars, seen here in a photospread in the November 16, 1947 issue of the Chicago Tribune. Though successful, Torres’s career wasn’t without its challenges. Metal shortages due to World War II severely curtailed his metal work at the peak of his popularity, and humble to a fault, Torres admitted to the Tribune that he often had difficulty demanding compensation for his works, even in times of financial duress. In Torres’s private life, his wife was said to have disapproved of his career, embarrassed by his “feminine artistic interests.” After her husband died, however, María Francisca became a devoted keeper of his legacy, archiving design sketches and clippings about his work. Shortly before his early death in 1949, Torres received a commission which brought his life full circle. The Pullman Company commissioned him to design the interior of five railcars for the Golden State Limited – the same train line on which the Torreses had arrived in the U.S. nearly 20 years before. He handcrafted opulent designs for the cars, replete with detailed copper friezes and elegant trim work. After debuting in 1948, his designs were seen by travelers all over Middle America, but also likely by Latin American immigrants to the U.S., making the same journey he had made more than two decades earlier.